Stretched Earlobe Repair – what’s involved? Interested in Prominent Ear Correction? Watch our video of the procedure being performed below. Hello, my name’s Adrian Richards. 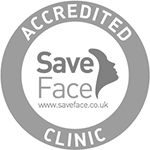 I’m a Plastic Surgeon and the Surgical Director of Aurora Clinics based here in the United Kingdom. Today I’m going to be talking through an operation I did on this young lady with prominent ears on both sides.